After my Classic 28 was broken into and trashed at the storage yard, I installed a Viper system. I had a simple hidden toggle switch that cut power to the Viper when we were actively using the trailer. Although the Viper was not meant for that use and had a lot of superfluous stuff like remote start, it really worked out pretty well. I had motion and glass break sensors as well as door switches and a switch on the front tinted glass that was the initial entry of the thieves. 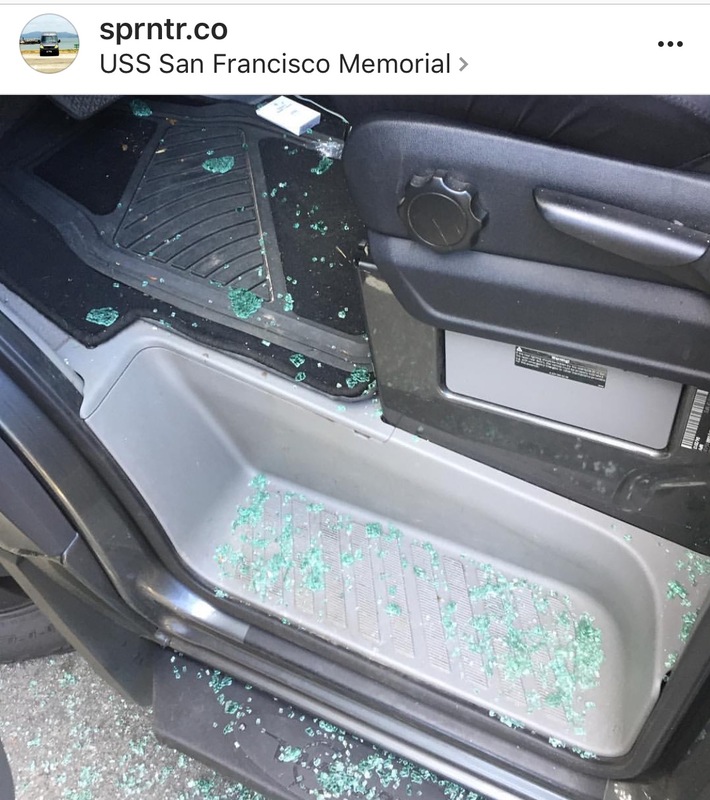 They raised the gravel shield by breaking the rubber loops at the bottom and smashed the front window. They then exited by the door. The first sensor switch I installed was on that gravel shield. If someone thinks there is a security system, it is about as good as actually having a system. I put little Viper blinking Electro-Luminescent Indicators in the trailer windows, front and rear. They are a negligible electrical load and are something thieves will see and recognize. I kept them when I sold the trailer and I may install them in the AI. One could be put adjacent to the windows on the sliding door that is the most probable point of entry. They only cost about $12 and even WalMart has them. They are about 1 1/2" square and 1/8" thick and simply hook to 12v. FYI from Instagram this morning. I see a lot of this on Insta and the variability in the targets is substantial - new Sprinter, old Sprinter, expensive Sprinter, spartan Sprinter - I've seen smashed pics of them all. And although one thread poster noted a security weakness at the sliding door, the majority of entries seem to take place at the driver's cab window, as this one did. This owner reportedly lost a laptop and recreational gear, and he said he was only 100 yards from his rig when it happened. And obviously it was a public place. Apparently I never posted back an update on how our Canary worked out. Or if I did, it wasn't on this thread where the Canary option was discussed. We ended up wiring a dedicated 12V outlet for it and permanently mounting it behind the passenger's side pillar (the Wendlands simply leave theirs on a table, IRRC). It broadcasts by pairing with my Verizon air card. It's the kind of device we don't always choose to use, but on those occasions when we need it, we REALLY need it. Yesterday was my nightmare scenario: Surface parking right downtown in an urban core surrounded by skyscrapers with our dog in the van. If ever the eye candy vehicle is going to draw criminal attention, those are the optimal conditions. I realize that prioritizing the welfare of pets reliably draws scorn from a subset of forum users, but it's important to us that our dog remain safe. She is not street-smart. A break-in within a dense urban core would send her bolting from the van in terror, and she would be run over and killed in the streets. I don't care about losing possessions and filing insurance claims, but the dog cannot be replaced. So, during my skyscraper meeting, I was able to keep the Canary channel open, running live feed (including audio) on my iPhone continuously from our Interstate. That allowed me to concentrate on the meeting and not be distracted by anxiety about the dog. Should anything have happened, there would have been a great sprinting from the meeting back to the van, which was close by. Think of it as being like Facetime with your Interstate. Here's our pooch on the couch, showing disgruntled body language at being left alone. 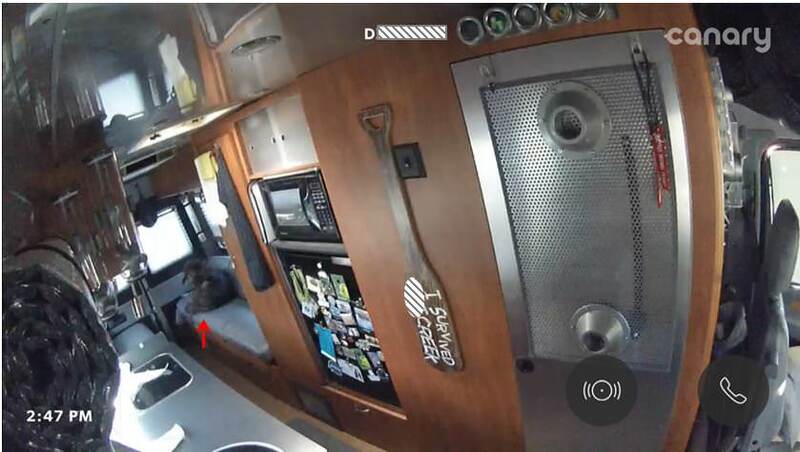 The foreground video feed is better resolution, so I put the red arrow as she is a bit blurry. You can see the two buttons in the lower right hand corner of this screenshot - one for an emergency call and the other for manual activation of the audible alarm. It's not a bad device for about $130. Another information-backfilling effort here... much of the security discussion to date has been on the topic of break-ins and how to prevent them and safeguard Interstate contents. This entry provides information pertaining to theft potential of the Sprinter itself. A contributor to another forum experienced someone attempting to steal their TV (tow vehicle, not television). The theft was stopped because the owner had a gizmo installed that alerted their phone in real time. That ensuing thread discussion revealed how easy it is to steal a vehicle that is supposedly protected by electronic chips tied into the ignition system (this came as a surprise to me). One of the posters recommended the Ravelco mechanism as a security option. This device has only been mentioned one previous time here on Sprinter and B Van Forum, and even with that, it was not mentioned in the context of the Interstate itself. 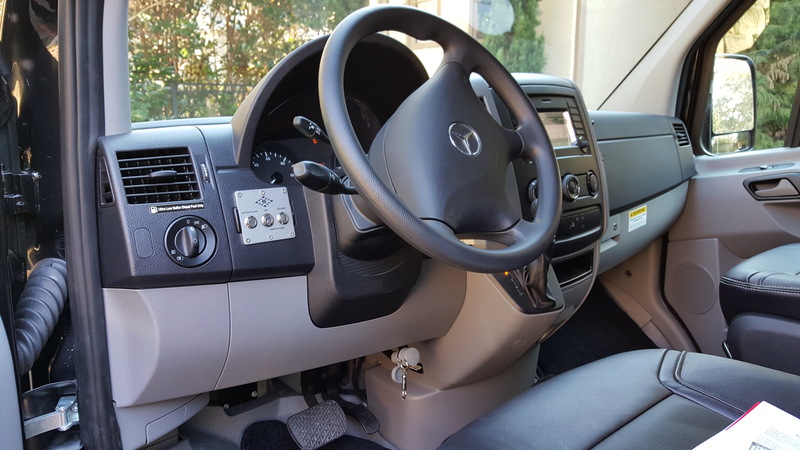 Here is a photograph of the device installed on a MB Sprinter. Looking in the context of Sprinters generally, I couldn't get a feel for how much of a theft risk there actually is. This Sprinter Forum thread wanders all over the place and isn't very definitive on the answer to that question. During those web wanderings, I also stumbled across this thread describing a well-known custom Sportsmobile that was stolen outright. I didn't find any evidence that it was ever recovered. Anyway, a bit more food for thought there. Are you using a hot spot or how are you connecting to wifi? If you're referring to my interior Canary pic above, it communicates via a Netgear AC791L. To me, the obvious way for someone to break into my AI is to pry open the opening window in the sliding door to pull up the lock button. I just ordered one of the blinking Viper electroluminescent logos to place by that opening window. The Viper logo is recognized by a lot of thieves and I put two of them on my Classic 28 after a break-in at the storage yard. Those logos blinked reliably for years, but did not survive removal from the trailer. I'll need 12v in the sliding door for the display. I'll get that by using a stretchy, curly cord from the gray cover, near my battery disconnect, to the sliding door. I happen to have a couple of cords on hand that I can use from old CBs and the like. I think you might mean this one (?). Please post pics of the installation that you do. None of the product pages that I've seen describe how it is powered. That's the one. It simply takes 12v. I'm hoping that I can find a suitable source at the battery disconnect switch by the sliding door that is hot with the battery off. If not, I'll run a non-switched hot wire as needed. The current drain is very low. On the trailer, I had switches in the 12v feed, but I never bothered to use them and I will omit them on the AI. It is bright! At one rally, someone asked me what that was that was blinking on my Airstream which was well over a hundred yards away. We're off to the Region 9 rally for a week. It should be in the hold mail when I return and I will publish photos of the install. That's the OBVIOUS way, agreed. But to thieves, it may not be the way they choose. Here's something I may have mentioned previously: Most people who break into Sprinters are practiced at breaking into vehicles generally. Out of habit, they tend to come in through the driver's door (habit tends to trump intelligence in these types). Hence my pic of broken glass in the other poster's footwell above. A blinking logo on the window just aft of the driver's door would discourage break-ins at that door. Not hard to get raw power from the chassis battery to that area. Again back to this issue, courtesy of the interwebs, which are currently bombarding me with targeted ads on account of (1) this discussion, (2) firearms discussions here and on another forum, and (3) people emailing me to ask about Interstate security. One of the targeted ads was for this component, which allegedly addresses the vulnerability represented by the slider. I have seen products like this on contractor Sprinters and other vans, and I wondered where the owners had gotten them. I sent an email to David at Sprinter Parts Depot asking if such a product exists for the T1N Sprinters. I have been working on a DIY security system but just not ready to post anything. I wanted something to tie into the MB CANBUS to take advantage of the existing comm lines and use existing keyfob. Parts on order - more to post hopefully soon. To me, the obvious way for someone to break into my AI is to pry open the opening window in the sliding door to pull up the lock button. That's the one. It simply takes 12v. I'm hoping that I can find a suitable source at the battery disconnect switch by the sliding door that is hot with the battery off. It is not as straightforward as just putting +12v to it, because you may not want it continuously on when AI is on/running but only when ignition is turned off, if to simulate a true alarm system, or risk someone actually catching on that it's only a decoy? If using as a "decoy deterrent", need to either have a manual switch or put a relay to engage it's ground wire when ignition is turned off. If you already have an existing Viper or any of the Directed Electronics systems or most alarm systems - just connect the red to +12volts and the black wire will connect to the GWA (Ground When Armed Output) of your alarm module. The SlickLocks website says it fits 2007-2018 Dodge, Freightliner and Mercedes Sprinters. So it looks like you just missed the year cutoff, unless SPD thinks otherwise. I did see that at the SPD site and wanted to order. But I noticed that the hasp/bracket for the sliding door sticks out a bit. With my door interior trim already rubbing slightly on the outside rail & trim pieces when fully opened (as others have experienced), I am debating if I may only get the one for the rear. But if I get the Norton intermediate door-stop kit, I think it's a non-issue. My 2014.5 has the opening window in the sliding door. Apparently, Airstream eliminated it on later models. I have no screen door. Perhaps the omission is because the projecting opening window knob would interfere with the screen door or because the door can now be left ajar for ventilation and still be screened. The opening window in my sliding door pops open slightly from trapped air pressure when the door is slammed shut. My AI is in a storage yard with excellent security when not in use. I wanted the Viper logo for times when it is temporarily unattended when on the road. A potential robber would not have time to realize that the display is always on. Actually, I am installing an always-powered cigarette-lighter outlet in the gray plastic cover behind the curb-side second row seat. You would not have that cover either on a later model. The Viper display will be powered through a curly cord that plugs into the new socket and moves with the door. If I ever want the display off, I'll just pull the plug. The display is here on my desk, but I may not have time to install it before the next rally.